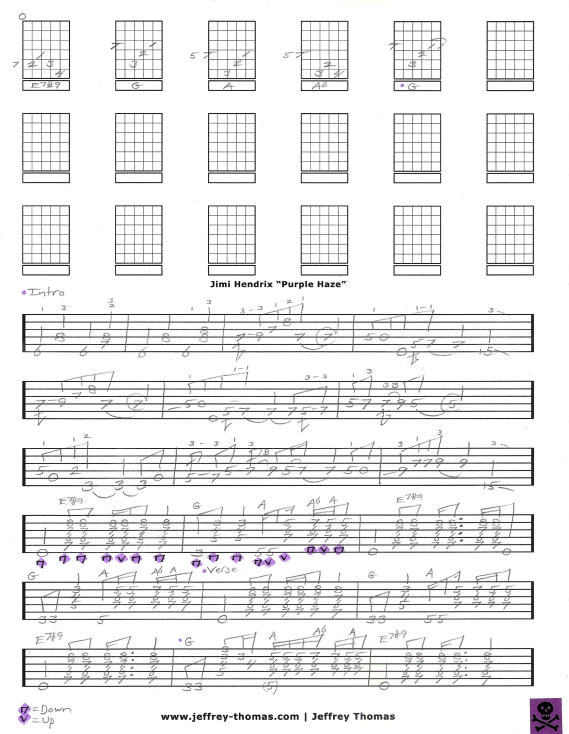 Jimi Hendrix Purple Haze Free Guitar Tab by Jeffrey Thomas. This guitar tab follows the original recording and produces a solid arrangement for one guitar. Learn the proper song structure, chords, rhythm and solo. Want the full guitar tab for free? Just enter your email address on the form provided and I will send it off to you. Jimi Hendrix’s guitar style is very unique and challenging to master. Much can be learned from his lead and rhythm playing. If you are interested in Jimi’s style of playing let me know. Make sure to fill out the Schedule A Free Lesson form so we can set up your free Skype guitar lesson today! “Purple Haze” was released on March 17th, 1967 and was referred to as a “Love Song” by Jimi. Find more popular online guitar tabs on my tab, blog and video pages.